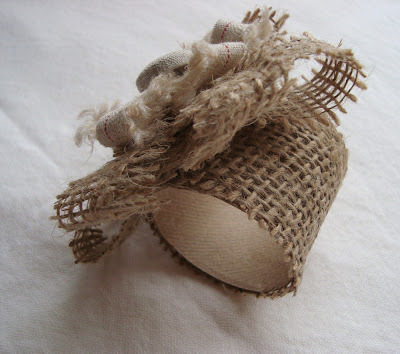 I combined some of my favorite ingredients for this burlap ring, all of which came from my scrap basket and recycling bin. Very festive for such humble materials! 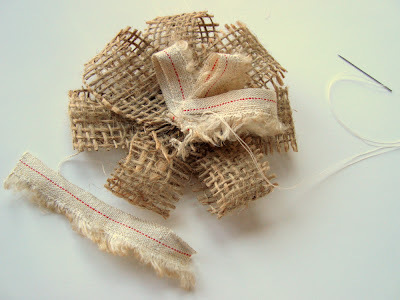 Burlap blossom- first loop: fold strip of burlap and secure ends with a stitch. Repeat first step until you've added all of your loops of burlap. Stitch each consecutive one to the next. Continue with smaller loops of selvedge. 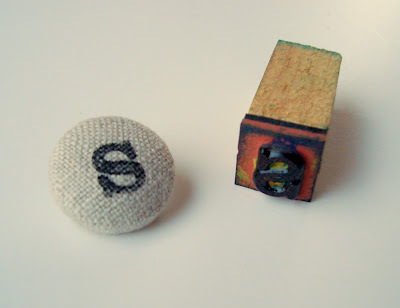 Cover a shank button with a piece of linen (kits available at most sewing shops). Stitch button securely to the center of the blossom. Cut a tp roll into thirds. Paint a section of roll with Mod Podge. 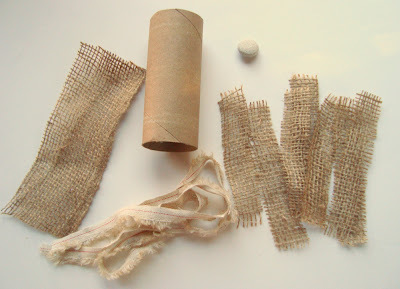 Attach a piece of burlap to the roll. 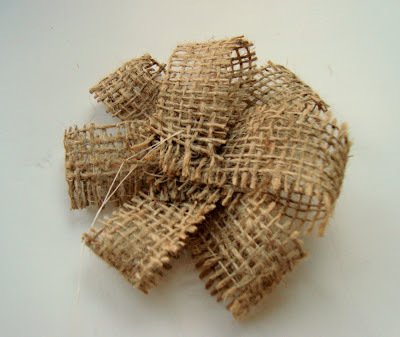 When almost dry, stitch the burlap blossom to the covered ring. If you're really opposed to needle and thread, I'm sure you could get away with glue gunning each stitch step. 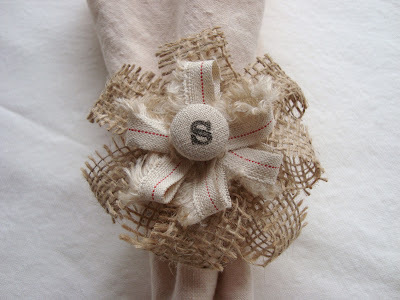 Don't you think a little burlap blossom would make a fabulous present topper, too?! There are so many ways to customize these... the basic ingredients are a tube and some form of ID: an initial, number, symbol. Make these in your favorite style, and your holiday table will feel complete and personal. I've got another very different version coming up! These are so pretty. If you make a table setting with all of these, please share a picture. Thank you for posting this tutorial! These napkin rings caught my eye in the pumpkin-chipotle post. Just like you say, they are humble, yet so festive... a wonderful addition to any holiday table. Love them, great idea, and so rustic looking. They are so cute, lovely vintage look, some things that french people are looking for. Much to my amazement I had never found your blog until yesterday. I am the director of a creative reuse center... and SO many of your projects align perfectly with materials we have in large quantities... THANK you for sharing your beautiful creativity! It must be National Napkin Ring week! :) I love the addition of the TP tube inside, that would be a helpful add-on to my felty acorn rings I posted yesterday. I love how we all use scraps of our own favorite materials. :) Yours is a beauty! Thanks for sharing. They are so pretty and so easy to make. I am going to make them in my classroom for the children to use. great idea maya, i love the materials you are using! 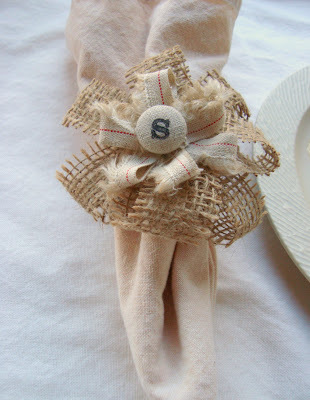 we also use only cloth napkins, what a lovely way to present them and dress the table up! They are very beautiful! I love your creative use of the materials! You have such a magical way with scraps of cardboard and fabric. I can't even glance at burlap without thinking about you. Laura- I used versacraft. They have a fabric ink pad that I use all of the time. Sweet! I was just thinking about napkin rings for my Thanksgiving table. It's nice!It's a good idea. I just found your blog via Crafting Rebellion. I'm your newest follower.